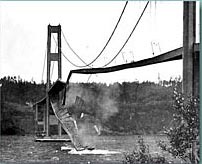 Yet 4 months later, on November 7 1940, the Narrows Bridge catastrophically collapsed in a windstorm into Puget Sound. Leon Moisseiff had unshakable faith in the reliability of his newly-completed masterpiece. He would have had no qualms whatsoever trusting its dependability in any weather conditions. Yet had he stood upon his own creation on November 7th, 1940, his faith would have been fatal. The object of his faith was unreliable, and the strength of his faith irrelevant. Faith has become the diametric of reason … practiced only by deluded fools who reject the graceful catenary and steel-plate certainty of scientific rationalism. Faith is an idea frequently voiced, but little understood. It is commonly mentioned in the pejorative sense in today’s secular society, where it has become a proxy for belief in the unbelievable, the unprovable, the superstitious and the mythical. Faith has become the diametric of reason — unreasonably so, as we shall see — practiced only by deluded fools who reject the graceful catenary and steel-plate certainty of scientific rationalism. Yet faith–not love–makes the world go ’round. You exercise faith when you place the key in the ignition and start your car. You have faith when you flip a switch, expecting light to rush forth from a fixture, or music from stereo speakers. You have faith that your coat will keep you warm and dry; your plane will stay aloft; your surgeon will bring you through a heart bypass. The atheist has utter faith in his reason, that belief in God is beyond logic and therefore must be rejected. Such faith is nothing more than trust: a confidence that the object is reliable, the tool is trustworthy, its behavior predictable, its nature dependable. In the physical realm, such trust may be based in part on knowledge — one can study the flow of electrons and principles of resistance which make a light bulb glow — but such erudition is entirely optional, and rarely grasped by those who rely on its behavior. The object of faith may be entirely reliable yet utterly beyond our comprehension — or, as Leon Moisseiff discovered to his great dismay, deeply understood yet profoundly unreliable. It is in the realm of the immaterial and the spiritual where faith comes most under scrutiny and is the subject of much skepticism. Such skepticism is of course most profound in the materialist, the agnostic, or the atheist — but each of us has a strong strain of suspicion about that which cannot be weighed, measured, seen, or felt. We want to understand before we trust — and labor under the pretension that we cannot trust until we understand, until such trust is “reasonable” to the input of our senses or the perceptions and insights of the mind. Yet the countless small acts of faith which allow us to move through life are far less frequently grounded in knowledge than they are in experience. We do not think twice about starting our cars, because we have, a thousand times before, turned the key in the ignition and had the engine roar to life. 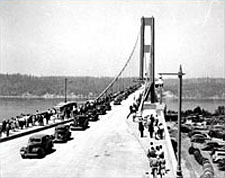 We cross the suspension bridge without hesitating because millions have done so before us — or more proximately, because the cars in front of us are passing over safely. Such experience may be personally acquired, or may be derivative: we trust the surgeon to remove our gallbladder, not because we have directly evaluated his skills and performance, but because others have trusted before us: his reputation about their satisfactory outcome has been imputed to us. Because others have trusted before us, and their trust has been rewarded, we find ourselves inclined to trust as well. It is common for the skeptic to argue that spiritual or religious faith is “believing things for which there is no empirical evidence.” But contained within this erroneous definition is the very seed of its fallacy: it demands of the spiritual and immaterial realm that it be subject to the measurements, the rules, and the limitations of the material, and presumes the non-existence of anything beyond the empirically determinable. The skeptic and the materialist are boxed in; their world is small indeed, allowing for nothing but that which the eye may see, the hand might touch, the mind may comprehend in its finite measure and the incompleteness of its intellectual grasp. … [T]he materialist philosophy (whether true or not) is certainly much more limiting than any religion. In one sense, of course, all intelligent ideas are narrow. They cannot be broader than themselves. A Christian is only restricted in the same sense that an atheist is restricted. He cannot think Christianity false and continue to be a Christian; and the atheist cannot think atheism false and continue to be an atheist. But as it happens, there is a very special sense in which materialism has more restrictions than spiritualism. … The Christian is quite free to believe that there is a considerable amount of settled order and inevitable development in the universe. But the materialist is not allowed to admit into his spotless machine the slightest speck of spiritualism or miracle. … The Christian admits that the universe is manifold and even miscellaneous, just as a sane man knows that he is complex. The sane man knows that he has a touch of the beast, a touch of the devil, a touch of the saint, a touch of the citizen. Nay, the really sane man knows that he has a touch of the madman. But the materialist’s world is quite simple and solid, just as the madman is quite sure he is sane. The materialist is sure that history has been simply and solely a chain of causation, just as the interesting person before mentioned is quite sure that he is simply and solely a chicken. Materialists and madmen never have doubts. Reason set adrift from the divine logos floats like an airtight bottle on a sea of confusion. It fashions tightly-woven arguments from false premises and faulty knowledge. It rejects the unprovable while proving the irrational. Reason may even conclude that its very foundation does not exist: that truth is a cultural artifact, that there are no absolutes. Such is the basis of the postmoderism which currently infects the lofty heights of academia, an insidious virus now replicating rapidly in the intellectual slums of public education and the irrational irrelevancy of college classrooms. Furthermore, reason detached from the transcendent — the same reason upon which the materialist and the skeptic rest their insubstantial security — must itself be the subject of skepticism. For in the purposeless, deterministic world of random chance and unordered events, who is to say that reasoned thought and scientific inquiry is anything but the random neural energy of an accidental life-form, no more connected to cause and effect than the spark which shuffled amino acids like cards into something we now call “life”? Faith embodies the confidence in that which we do not necessarily understand, but have found to be experientially reliable. One can, almost surprisingly, have a profoundly misguided or erroneous understanding of a trustworthy object — and still that object will remain trustworthy. Cro-Magnon man, magically transported by time machine to the twenty-first century, might well believe that switching on a light is black magic or the work of the gods — but when he flips the switch, the bulb will still emit light. Thus faith depends, not merely in the confidence that its object will be reliable, but on the inherent reliability of the object itself. Thus the poles of faith are opposite yet complimentary: there must be trust, even without understanding, and the object of trust must be reliable and dependable. This dialectic is at the heart of religious faith: the trust in something unseen and poorly understood, which nevertheless proves experientially trustworthy, because its object is utterly reliable. It is here that reason and faith coalesce: reason, guided and given purpose and boundaries in the transcendent, points to that which exists but is beyond our capacity to comprehend with intellect alone. Faith beckons us to span this intellectual chasm with the bridge of trust, drawing us to experience that which we lack the means to grasp without it. Reason may block us from faith, constricted as it often is by self-imposed constraints — or reason may confirm and reinforce that which we experience by faith. Trust in the transcendent transforms us, expanding the limits and restrictions which we arbitrarily place upon reality. The man of faith sees an effect, and attributes its cause to the transcendent, while open to the possibility that the cause may be random or material in nature. The skeptic has no such freedom: the cause cannot be the transcendent, for the transcendent does not exist. His viewpoint is “reality-based” only insofar as the reality he trusts excludes the transcendent. The man of faith can afford to be wrong, and may often be so; such is the process of growth in the unseen world. The skeptic cannot be wrong — for if he is, his worldview is utterly demolished. There is, however, another aspect of faith which must be met, if this trust is to bear fruit in deepening our experience and our understanding of the transcendent. This is the transaction of faith: the trust must be grounded in and bounded by the nature of that which is trusted. A light will not illuminate by flipping a switch unconnected by wires; a car will not start by placing your house key in the ignition, or your car key in the door. The nature of the object demands that the action based on trust be within fixed parameters dictated by the object’s design or character. There is more to be said about this transaction of faith, integrating reason, experience, and revelation into a working dynamic which broadens our horizons far beyond the restrictive limits of the material and intellect constrained by its finite vision. Such thoughts must await another post on another day — which I trust will be soon forthcoming. Yes. I just want to remind you that faith precedes reason. Fides quaerens intellectum – I believe Anselm stated this. You have to step reasonably into the dark in faith based on good premises, but cannot go too far until reason catches up. Otherwise you have overstepped into superstition.